A natural invigorator, rejuvenator and liver tonic, Polyporus Umbellatus is even said to help men regrow hair, or at least slow down hair loss! 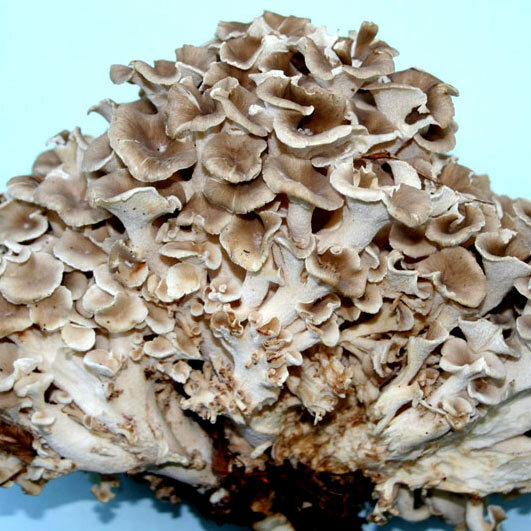 A close relative of Grifola frondosa (Maitake), Polyporus Umbellatus differs from most medicinal mushrooms in that traditionally it has been harvested as sclerotium, an underground 'seed' or 'nugget' which grows in the mycellium. It is reported that long term use makes one feel happy and vigorous and look younger. As well as its traditonal use as a diuretic, polysaccharide extracts of Polyporus Umbellatus show promise as adjuvant (A substance that enhances the body's immune response to an antigen) alongside chemotherapy and is licensed in China for use in cancer therapy. The Umbrella Polypore is highly anti-viral and has the unusual property of reducing Chlamydia activity in sufferers of this common STI. It has even been use traditionally for fighting Hepatits B, but more research is required to verify this property. A novel, and unusual, property is for hair regrowth in men. 3 compounds have been isolated which have now been show to stimulate hair regrowth in a Japanee study by Ushida, 1990. These compounds are acetosyringe and polyporusterone A and B.